In my last post I told The Story of the Spoons, which, if you missed it, or would like a refresh of the story, you can find HERE. (it will open up in a new window for you). I shared a glimpse, at the end of The Spoon Story, of my own personal spoons which related to me and my own story, and promised that I would share each of the spoons in the photograph with you in a separate blog post — and here I am, as promised, sharing my spoons. In the photograph above, I’ve numbered each spoon so that you can check it against which spoon you’re reading about and looking at. There are 12 (twelve) spoons in total and each one is decorated differently than any other in the set, and each of them has a meaning to me. I’ll give a little explanation of each spoon as I share them. Shall we get on with it? The photo on the left shows spoon 1 and a spoon before I’ve given it a make-over. (The purple rule at the bottom is showing measurements in centimetres). The close up photo on the right, is the best one out of about ten that I took. I think it’s the glitter which made this spoon difficult for the camera to know where to focus. All that twinkling. The spoon was coloured using Alcohol Inks, then the bowl of the spoon was treated to three different colours of glitter, and I would like to believe it looks like a magical Fairy sky would look at Sunset, with twinkles of many colours. The crescent moon is a Tibetan Silver charm, of which:- the moon part I covered in very fine silver glitter dust. The bright yellow/gold, is a star. And the Fairy Wings were given a white glitter covering. Spoon 2. This second spoon talks of my love of Poppies. My mother grew some spectacular Poppies in her garden, and after she passed, Mr.Cobs collected the dried out Poppy heads so that I could grow her Poppies in our garden. And then, after we sold our old cottage a few years ago, Mr.Cobs made sure that I had a plentiful supply of Poppy seeds from dried out Poppy heads to take 200 miles to our new cottage and we began to grow those Poppies all over again in our new garden, here in ‘Cobweb Cottage’. The handle of the spoon is painted in the Poppies and the colours of them – red, black and yellow – using alcohol inks. The Poppy in the bowl of the spoon is decoupaged, using printed tissue paper and Modge Podge. The plant pot on the bowl of the spoon which the poppy is ‘growing’ out of, was made by me from clay and I ‘mossed’ it up a little to give it a bit of texture. Spoon 3: Spoon three is about being a Spoonie – as you might have guessed by the teeny tiny spoon on the handle. I talked about and explained what being a Spoonie was in my last post: The Story of the Spoons (link supplied in the first paragraph of this post). The colours of the spoon don’t quite show up as the true colours – but they represent pain, discomfort, golden days of fabulousness, and a touch of black because pain can be a real meanie. The teeny tiny spoon on the handle basically tells you what the tea-spoon is about. Again, the colour on the spoon are made using alcohol inks. Spoon 4 is Butterflies. I love butterflies. They have a love of life which shows itself in the way they get so excited when they’re flying. It’s as if, with every flap of their wings, they’re mind-blowing, excitedly saying, over and over, “I’m alive! I’m Alive! I’M ALIVE!”. I think it was my very first visit to a Butterfly Farm many years ago, which sealed the deal for me regarding butterflies. I never knew there were SO many truly AMAZING species of butterflies in the world, and … I found out on that visit, that some butterflies love painted toe nails!! One butterfly kept me captive, sat on a bench, with my leg stretched out, while it investigated the pinky red nail polish which I had on my toes. I think it was at that moment that my heart was stolen by that butterfly and I have an allegiance to them for ever more. Spoon 5 . . awww, I love, love, love this spoon. It’s WAY prettier and filled with heaps more magic, than the photo’s show it to be. It’s what I think a Galaxy should look like. And … Magic. I reckon every magic spell should work only after you’ve waved your wand and a flash of magic happens in the colours and ‘amazingness’ of that spoon. The colours are all made using alcohol inks, and I then added different types of glitters and teeny, tiny sequins to, and finished it off with some flat backed pearls on the handle. These bear spoons talk about my affection for Teddy Bears. Not all of them, but there are some bears which ‘speak’ to me and it’s those bears which I fall in love with. I don’t collect bears though. I still have my very first Teddy Bear which was given to me not long after I was born, and is actually older than me – (so there IS something which is older than dirt then!). As a child I loved that bear so much and he went everywhere with me. Many years have passed since I arrived on this planet, and I still love him (‘Teddy’ – his name is simply ‘Teddy’) just as much now, and there are times that I will pick him up and give him a hug – just like I used to all those years ago. Mr and Mrs. Bear spoons were both made using alcohol inks and decoupaged with bear patterned tissue paper, and finally, some of those tiny beads (which I still can’t remember the name of). amended to add: They’re called Micro Beads – thank you Beverly Parkison of More Ink Please, for your brain power! Spoon 8 . . . tells of my incredulous awe of Dragonflies. I LOVE them! They’re the most astonishing, magical little creatures, made by One who knows more than any artist will ever know. Alcohol Inks were used to create the magical colours to spoon 8. Spoon 9 . . . kind of speaks for itself. It has a Cobweb (guess why) on the handle, and a tiny handmade (by me) Fairy House nestled in the bowl of the spoon. I couldn’t get all the colours to shown up in the photo’s, but there’s blue, green, red, yellow, and peach – all of which were obtained using Alcohol Inks. The bowl of the spoon is decoupaged in tissue and the tiny Fairy Home is finally attached to the bowl. Spoon 10 . . . well there had to be a ‘loving spoon’ somewhere in the mix, because ‘love’ is what I’m all about! Again, this spoon has some really beautiful colours to the handle, and I love the way the Alcohol Inks blended together in the forming of the pattern down the handle. The bowl of the spoon was decoupaged with tissue, and I added a wiggly line of three different colours of glitter all around the edge of the spoon. Finally, I fixed the pink gemstone heart, set in a rose gold colour metal bezel, to the centre of the bowl, added two gems to the handle and VOILA! Spoon 10 was complete. I once captured a dragonfly – well … I’m not really sure I ‘captured’ it or if it simply wanted me to share its beauty. . . . It landed on the windowsill outside the dining room window, and I put my hand slowly and carefully next to it as you would if you wanted a bird to step onto your hand. The dragonfly did that very thing, and I then got Mr.Cobs to put some leaves into a large round glass vase thing. I offered up the big glass bowl/vase to the dragonfly and . . . he walked in!!! (The dragonfly walked in, not Mr.Cobs! eeek! lol). I knew that Daughter No.2 would have loved to have seen it, but she was only (around) 8 years old at the time, and it was a school day . . . the school was only across the road. . . and I was known at the school as I did some voluntary teaching there with children who had learning difficulties, . . . so . . . I walked the glass vase/bowl over the road to the school, knocked on the classroom door and spoke to the teacher, showing her what I’d got. She was thrilled to bits, and asked if perhaps I would leave it with them for the afternoon. I did …. and then when I collected daughter No.2 at the end of the day I took the vase/bowl outside and we released the dragonfly together. He took off and we watched him until we could see him no more. That Dragonfly put a memory in my heart so strong and so magical, that I simply had to dedicate a spoon to it. Spoon 12. . . the final spoon in the set of twelve spoons, and is a celebration of my love of Pearls. I have long strings of pearls, short sets of pearls; medium lengths of Pearls. One strand, two strands, three strands and four strands. I have my Grandmothers Pearls (which I got married in, despite everyone telling me that it was bad luck to wear pearls on your Wedding Day). I’ve got Pearl Earrings – drops, studs and clips, and pearls in different colours. I have rings with pearls in them – my oldest is a Pearl and Ruby ring bought for me for Mothers Day when our girls were little. And I have a brand new set of Pearls, shorter than my smallest set, but they’re BIG pearls and the lustre is like they’ve been dusted in Fairy Dust. They were bought for me as an early Christmas Present, last month. I saw them, fell in loooooooove with them, and then discovered that they were (just for ten days) on sale at 50% off! BARGAIN OF THE YEAR! Mr.Cobs said ‘yes’ straight away when I mentioned them to him, and so the deal was done. I only have one set of ‘pretend’ pearls – which I wear when I’m with Little Cobs. Not saying that he would break them – but I would cry a lot less about those being broken than I would about any of my other pearls being broken. BIG TIP OF THE DAY .. for all you fellow necklace of any sort wearers: If ever you break your string of beads or pearls, and A) can’t get them re-strung for whatever reason; and B) don’t have the special beading string to re-string them with; then you can use the second best thing…. Dental Floss to re-string them yourself! Yes, I kid ye not. Dental floss is really strong and thin enough to go through a bead/pearl and hold a whole length of beads/pearls. And that’s it. Cobs Spoons because she’s a spoonie. (again, if you don’t know what that is, see the link at the top of this post and you’ll be able to read). Of course … you don’t have to be a Spoonie to have a set of decorated spoons. You could have a set just to celebrate who you are. Or maybe tell a story which is a favourite of yours or someone elses: Maybe Christmas Bear Spoons? : Night Before Christmas Spoons? : Hungry Caterpillar Spoons? : Harry Potter Spoons: Wuthering Heights Spoons? : Apostle Spoons? – or any thing, any person, any story etc etc which means something to you. You could make one, two, three or as many spoons as you would like, to keep or to give as a gift to someone else. For a child. A Wedding Couple. Anniversary. Birthday (maybe even give one each year). Easter. Christmas. Spoons in a theme – cats; dogs; birds; cars; fancy handbags; expensive shoes; etc. A spoon for a nurse, your doctor, your childs teachers. ANYONE. Obviously, if it’s a gift you’re going to want to present it nicely, simply wrapped in beautiful tissue and a ribbon. But it would make such a great gift and because you were making it for a particular person, for a particular reason, it would be personal, and how much more perfect could that be?!! Do let me know if you feel inspired to make a spoon or two. You don’t have to spend tons of money. Just some Tissue Paper, some Modge Podge, maybe a little glitter or a small decoration (try looking for junk jewellery at your charity shop which you can break apart and use some of the elements from), and that could be all you need! Obviously you can get as decorative as you like. But these metal spoons are a really easy project to make. Even a total non-crafter could make these. Truthfully. Thank you so much for coming and spending some time with me. It’s great to have your company. Wishing you a blessed rest of your day, and a truly fabulous new week . . . Previous The Story of the Spoons. Next There’s a Rang-Tan in my bedroom . . .
Oh Cobs!!! I love your spoons. I really grinned about the bear spoons. I love the fact you still have your teddy bear even though he is older than dirt. I will not tell Chicken Granddad that; as his mom threw his away while we were on our honeymoon 38 years ago. I am not totally sure he has yet forgiven her on that one! He looks pained when that subject comes up. I do really need to give this a try as I have a lot of spoons from a box of “junk” that I somehow wound up with years ago. If I do I will post a picture for you to see! Ohhh that would be BRILLIANT Chicken! It really is truthfully as easy as 1.2.3. You won’t believe how simple it is when you begin. Poor Chicken Grandad and the loss of his Bear. I really feel for him, as I know how upset I would be if my bear went missing. There are things which got given away to the Charity Shop before we moved, and things which got broken in the move, and 7 years on, I still can’t come to terms with not having them anymore. Why is that I wonder? Normally I’m such a ‘Let it Go’ kind of person . . . but as I got past 21 years old, things have become more and more important to me, and these little lost things from the past are some of those things. Aren’t we strange creatures, us humans? lol. I shall be over to your blog soon …. I’m on a mission tonight to try and catch up with as many blogs as I possibly can, before the energy runs out! I’m so far behind that it’s beginning to upset me now, and I know that it’s offending some folks, so I’m a Woman on a Mission! See you on your blog soon! I totally understand on being behind on blog reading. Not to worry! Aw thank you Rose Elaine. That is so kind of you. Thank you for coming and visiting. It’s lovely to see you. Aw I’m tickled down to my toes that you have some ideas from looking over my spoons. I hope to see a blog post sharing a spoon or two from you soon! (fingers crossed). Oh my yes these are wonderful.and so creative. But of course that would be expected coming from Cobs tower of magical stuff. I think the dragonflies are a fav …no…the butterfly…..no the poppy. Well you get the idea. ps. are they micro beads? Maybe not they look smaller. MICRO BEADS!!! Go to the head of the Class, Bev. You fabulous, wonderful, brain in gear and working, woman! I shall add that to the post and tell everyone that it was indeed Mrs. B.Parkison who told my sleeping brain what those beads were called! I’m tickled to pieces to read about the watching of Aladdin a hundred times over the 4 days. LOLOLOL. Aww … I bet you know every word of the songs and could sing them backwards now! lol. They certainly made an incredible amount from the fund raising effort! How amazing is that?!!! Certainly worth every effort put in. Well done those folks. Thank you for coming Bev, and for your lovely chatty comment. I adore chatting with you. But … you know that already. Bev . . . I have left comments on your blog, but they’re not showing up. I keep checking but nothing appears. Perhaps check your ‘Spam’ folder. Maybe the misguided elves on your blog are putting my comments in that folder. I don’t see them. How do I check? Found it. and yes they were there but left as soon as I clicked not spam?? ?Will they show up? They’ll only show up if you ‘Approve’ them. I can now see three of the comments – and you’ll see them if you visit your blog posts (I think). The last post, and the one before the last. I’ve never had to approve any before. wonder shat changed? Aww it’s great to see you. I’m so gladdened that you like the spoons, and especially thrilled that you feel inspired to go and make some for yourself. But … if you decide to go and buy a selection of inks, make sure you use some gloves (I buy those boxes of latex gloves – use and then throw away). Because otherwise your fingers will get stained with the Alcohol Inks. Not for days on end … but some of the colours will stain for about 24/36 hours – and if you need to be somewhere where you have REALLY clean hands, then best use some gloves. Get some cheap cosmetic sponges too, Kim. I buy mine from either B&M Stores, or from Poundland. A bag of mixed shaped cosmetic sponges for either 99p or £1. They work brilliantly for Alcohol Inks. But again … use and throw away. It’s not worth keeping them. Thank you so much for coming Kim. Love seeing you. Thank you for showing us details of all the spoons. They are magical! I am not good at crafts of any sort, but I did think of something I’d like to do. I’d like to think of how I would decorate spoons to reflect my life. We have busy times coming up with lots of house guests, so I might not get to this any time soon. I’ll keep it in the back of my mind, though. Well if you ever actually sit down and enjoy yourself by getting a little creative with a spoon or two, I would absolutely love to see the results of your efforts. I think you’d be surprised at how easy you’d find this was. Someone who I think might really enjoy this craft is Mr.Logan. Sleeves rolled up, and some paper covering the table …. I reckon he’d really get into it Anne! Thank you so much for coming for a visit. I so love to see you. Logan’s mother is an artist. I don’t know that she does artistic things with her son, but I suspect she does. I don’t have any craft supplies. To tell the truth, I don’t want any! I have shelves of music scores that I haven’t touched in ages, and that would be my first love of things involving my fingers. I am simply content to admire your talent and the beautiful things you create. 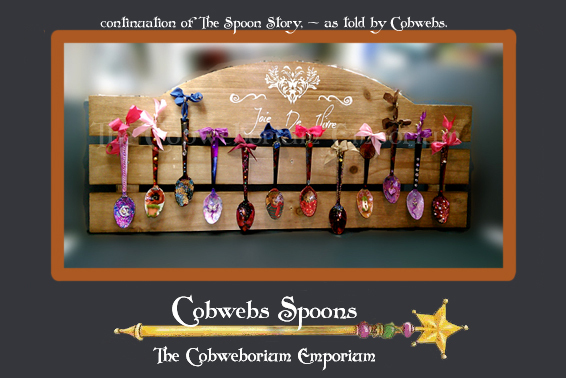 What a lovely spoon collection, Cobs! Thank you for sharing the meaning of each one. The poppy spoon & the pearl spoon stories touched me the most (this first reading, anyway). Hope you are having a good day! Hugs! aw, it’s lovely to see you. I’m so happy to hear that a couple of the spoons stories and reasons for being there stuck out for you. Bless you for coming Kathy. It’s so lovely to chat with you. Have a truly lovely week. Hello Daisies! 🌼 Great to see you! Ohhh, I do hope that you get around to spending a little time making a spoon or two. They’re so easy to make and give so much joy when they’re made and you ‘stand back’ to look at what you’ve made. They’ll make fabulous gifts – and what greater love can you get than someone giving their time freely to make something personally for you? these are the prettiest spoons that I have ever seen! Each one of them are stunning! Could one be used in a sugar dish? Aww, I’m glad you like the spoons. Sadly, no, these can’t be used in a sugar dish. They’re just for display. But … if you wanted to make yourself a prettier spoon for your sugar dish, I highly recommend Pebeo Paints. Pebeo do various different paints for different things and surfaces. You’ll only have to Google and you’ll be given the answer of what particular Pebeo paint you need for the surface you’re going to put it on. They really are great paints. I highly recommend them! Again, thanks for coming Rabbit, and for taking the time to have a chat! I have learnt something new today. Never, ever, have I seen decorated spoons! They really are unique. And even mores so with the special stories attached to them. I’m just tickled pink that you like the spoons. Thank you, my fabulous fellow blogging friend, both for coming and for taking the time to stop a while and chat! Aw, it’s great to see you my lovely blogging friend. ‘Flittering’ … yep, it’s a word! Well …. I know ‘flitter’ is a word, so flittering has to be, … if it isn’t, then it is now because you and I both use it, so therefore, by common usage – I declare it’s a word! There. sealed in stone. Well … in pixels, at any rate. lol). Daughter No.2 was very, very close to my mother – her grandmother. They were like a small gang of naughty when they were together, and when sat together watching a film or something of interest on TV, you could walk into the room and actually feel the love in that room shared between them. Sadly, my mother passed away, unexpectedly. Both myself and daughter No.2 were with her when she passed, peacefully, in hospital, almost 15 years ago. The loss of her adored Grandma hit D.#2 badly and she’s never really come to terms with that loss. Well . . . when D.2 got married nearly 9 years ago, the day before the wedding I sat in the bedroom and ‘spoke’ to my mum, asking her to visit the wedding, and show up as a white butterfly. Guess what flew into the church the following day!! Then later, at the outdoors picnic reception, a white butterfly came and stayed, fluttering from place to place, flower to flower, for aaaages. I could have cried with joy about this. (If I told you what I found on the photographs that I took that day, you’d get a GREAT BIG goosebumps moment! – but I’ll leave that for another day). So .. I’m with you all the way with the butterflies theory. I too am a believer. Aww, thanks so much for coming Nancee. Love seeing you here, and chatting with you is always such a joy. I love the spoons. So pretty!!!! and the story was amazing. xoxoxox my friend. Sorry to have coffee and run. I have missed you! I have this neext weekend off. I am hoping to post some projects and let everyone know whats been going on!. I think i might need more spoons ❤ xoxoxoxo my friend. Have a fabulous week. Glad you liked the spoons and the Story of the Spoons too. Thanks for visiting Tam. It’s truly lovely to see you. Sending love to you Tam. Don’t over-push yourself my lovely friend. Remember that in everything that needs to be done, it’s you that’s the important ‘bit’. Without you, nothing gets done. So pace yourself, Missy! Lovely, Cobs… so very intricate. Each one is different (even Mr and Mrs B) so it is hard to pick a favourite!